The late Supreme Court Justice Antonin Scalia was known as a famously combative, often polarizing figure whose strict constitutionalist ideology won him as many adherents as detractors across an increasingly divided United States. Yet it was Scalia’s gregarious charm, sparkling wit and irrepressible joie de vivre, as much as his judicial philosophy, that brought thousands of dignitaries, friends, local residents and tourists to his beloved court on a cold February morning to pay their respects. "I met him once. He was so gracious," said Washington resident Cliftine Jones. "It was my mom’s birthday. He wished her a happy birthday. It was heartfelt, genuine." "He’s an outstanding American," she continued. "A lot of people take our rights, and our country, for granted. He didn’t." Indeed, the combination of Scalia’s razor-sharp judicial mind and his irreverent charisma appeared to echo most prominently among those waiting to view his coffin. "I came today because I respect his fierce intellect, his undying passion for his faith and his splendid wit," said Sunjin Choi, a Korean-American from Fairfax, Virginia. "Plus, I love opera, and so does he," Choi said. "I also admire his friendship with Justice [Ruth Bader] Ginsburg, who does not share his views. But they bonded with music, which is splendid." 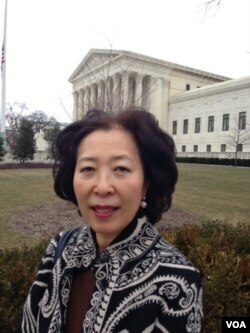 The Korean immigrant noted that she does not always agree with Scalia, but came "to pay respects for his contribution to this wonderful country." Scalia’s coffin, draped in an American flag, was on display all day Friday so that his fellow justices, law clerks, Supreme Court employees and Americans who simply respected him could pay homage to the current court’s longest-serving member. Groups of four former clerks stood guard beside the coffin at all times, rotating every 30 minutes. Lawyer Dave Kruetz flew in from Toledo, Ohio, because he admired Scalia's judicial philosophy. Kreutz said there has been a lawyer in his family every generation since Joshua Seney represented Maryland at the 1775 Second Continental Congress - the group that led the American revolutionary war effort and moved the 13 colonies towards independence. He sees Scalia as a towering legal figure. 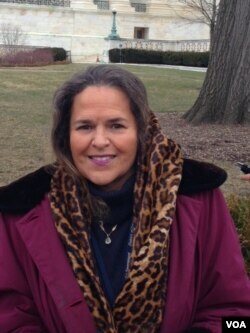 "Our family considers Scalia to be the greatest justice of all time, so I’m here to wish him well," Kruetz said. "We believe in the text of the Constitution, and [Scalia] had the ability to interpret that very closely to how we feel it should have been done." 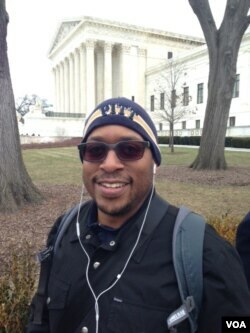 Others, less enamored with Scalia’s ideology, felt connected nonetheless. "I came today to pay respects to a public servant," said Washington resident Dwight Jefferson. "I’m a public servant myself, and it’s a duty I take very seriously." "Even though I didn’t agree with Justice Scalia’s view of the Constitution as a document set in stone, I still respect him," Jefferson said. Two federal appeals court judges who have been mentioned as potential Supreme Court nominees — Sri Srinivasan and Patricia Millett — were in the line of those paying their respects. President Barack Obama, accompanied by first lady Michelle Obama, also came to say farewell, pausing beside Scalia's coffin. T.J. Schmidt, a lawyer from Kearneysville, West Virginia, drove to Washington with his two children for Friday’s ceremony. "I felt it was important to show my kids a little about our country," Schmidt said. "I think, regardless of ideology, he was well-respected on the court, and his wit and ability to articulate his positions will be sorely missed. "As an attorney, I certainly read a lot of his opinions and dissents. I tend to support most of his decisions, but I don’t see eye to eye with him on everything." Neither does Evan El-Amin, a New Jersey resident who works for Thompson-Reuters. "I didn’t always agree with Scalia, but I do respect [his] process of thinking about things," he said. That’s a sentiment clearly shared by many.